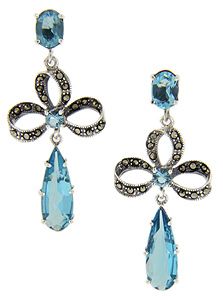 These sterling silver earrings have vibrant faceted blue London topaz are set on the top and dangling from each earring. The earrings are in the shape of a bow and are studded with marcasite. The earrings are set in posts.